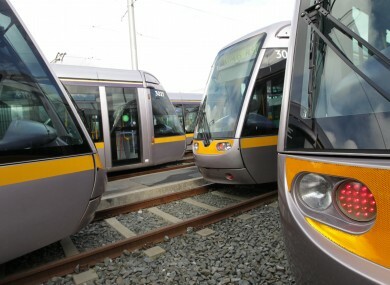 Dublin’s Luas service will grind to a halt on Easter Sunday and Monday after tram staff rejected a new pay deal. MINISTER FOR TRANSPORT Paschal Donohoe has declined to comment on a new pay scale proposed by Luas management that would leave new entrants on lower pay than current staff. Trade union Siptu confirmed yesterday that it was proceeding with a planned strike on the tram service on Easter Sunday and Monday. The move comes after workers rejected a deal involving gradual pay rises over a period of just under three years. Luas operator Transdev said the offer, following days of negotiations at the Workplace Relations Commission, was “at the very outer limits” of what the company could afford. Siptu said its members did not want to accept proposed productivity measures and a lower pay rate for new drivers, which would bring it back to 2004 levels. In an interview on RTÉ’s Morning Ireland today, Donohoe said he did not think it was appropriate to comment on “any particular aspect” of the package put forward by Transdev. However, he said his “overall view” was that listeners to the programme would note that the drivers’ pay claims are “significantly ahead of the expectations they have for their own salaries”. “As minister for transport, it is not acceptable to me that a form of public transport now faces indefinite strikes into the future,” he said. Donohoe also ruled out intervening in the dispute, saying he was “not going to take out the chequebook of the taxpayer”. To do so, he said, would “create massive costs for the taxpayer in the future” and “undermine our ability to resolve issues like this across our entire economy”. The minister called on Siptu to withdraw the strike notice to ensure services go ahead over the weekend. “This happened for [St Patrick's Day]. It should now happen for the national days of commemoration,” he said. Responding to the remarks on RTÉ’s Today With Sean O’Rourke, Siptu president Jack O’Connor said the rules of the union did not allow him to direct people to go back to work. “And if I was one of those workers, I wouldn’t go back to work because I have participated in a democratic decision,” he added. O’Connor said he was prepared to discuss the inadequacy of the WRC proposal with anyone, including Donohoe, if he was “prepared to roll up his sleeves and stay off the media outlets for a few minutes or a few hours”. He said workers had strenuously objected to the “very, very regressive concept” that “people who are recruited between now and when the Luas extension is ready to go would be paid on a new entry rate which is considerably lower that the lowest rate which applies to workers when they join the company at the moment”. Transdev said yesterday that its management were shocked and disappointed at the rejection of the WRC deal. It said the proposal would have seen the salary of a driver on €42,247 increase to €50,000 by January 2019. Siptu organiser Owen Reidy said in a statement that there was “a complete breakdown in the relationship and trust between the driver grade and management at the company”. The two days of strike action have been timed to cause maximum impact, with some half a million people expected in the city for the 1916 centenary commemorations this weekend. Email “Paschal Donohoe declines to comment on proposed entry-level pay cut for Luas drivers”. Feedback on “Paschal Donohoe declines to comment on proposed entry-level pay cut for Luas drivers”.